Millions will tune in to Doctor Who tonight to see Matt Smith hand over the Tardis to Peter Capaldi, the latest incarnation of the timelord. Matt Smith's swansong episode as Doctor Who had to be reritten after he injured his leg, according to reports. The injury was written into the script of the Christmas Day show so fans will see the timelord lose a leg after a battle with the weeping angels. The Sun reported that fans will see the doctor grow old fighting cybermen and daleks after being drawn back to a planet called Trenzalore by the sound of a bell. Smith, who is replaced by Peter Capaldi in the Christmas Day episode, said he was excited about his final appearance. 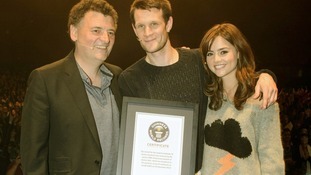 The 50th anniversary episode of Doctor Who has broken a Guinness World Record for the world's largest ever simulcast of a TV drama. Last night's episode set the record after its was broadcast in 94 countries across six continents following a massive global campaign. In addition to the TV broadcasts, the episode was screened in more than 1,500 cinemas worldwide, including in the UK, US, Canada, Latin America, Germany, Russia and Scandinavia. More than half a million tickets were sold for the theatrical screenings at which fans were able to watch the episode in 3D. Viewers around the world saw Peter Capaldi make his first - all be it brief - appearance as The Doctor in the 50th anniversary episode. The newly found programmes - which introduce the character of Alistair Lethbridge-Stewart, better known to audiences as The Brigadier - will be available on iTunes from today and will later come out on DVD. Phillip Morris, the director of Television International Enterprises Archive, unearthed the programmes by looking up the records of overseas shipments of tapes made by the BBC. The stories, The Enemy Of The World (1967) and The Web Of Fear (1968) and both starring Patrick Troughton as the second Doctor, have now been remastered by BBC Worldwide, the corporation's commercial arm. The previously lost nine shows were among 11 traced to a television relay station and the find brings back to life an entire six-episode story, while another is almost complete. An article penned by Peter Capaldi in 1976 and published in a Dr Who fanzine has appeared online. It comes after Capaldi was named as the star to replace Matt Smith as the Time Lord. The article describes the opening sequence of Doctor Who and praises the 'artistic integrity and sensitivity' of Bernard Lodge, the man behind five opening titles sequences. Clearly in awe of Lodge's work, and an avid fan, Capaldi writes: "The wonder of the opening is that it manages to capture in only a very few moments of screen time the atmosphere of Dr. Who." He adds: "When that blue police box zooms in from a morass of complex light forms, there is no question of its right to be there. So already, within seconds of starting, the title designer has drawn us into the world of Dr. Who."